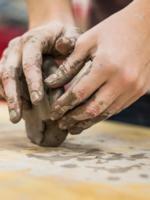 Details: Adult Creative Clay: Hand Building Session 1: Tuesdays, 6:15 - 9:15 pm. January 29 - March 5. Instructor: Sheila Anderson Session 2: Thursdays, 6:15 - 9:15 pm. April 11 - May 16. Instructor: Veronica Wilde Students will learn the basics of clay and hand building with exciting creative projects, glazing and firing techniques. No experience necessary. $160/session. $136/members.